James Kennedy built the Kennedy Trail in 1861 to provide a land route for early settlers between New Westminster and the natural pasture land at Mud Bay. He did this during the very beginnings of European settlement on the mainland of British Columbia. At the time, New Westminster was two years old, Surrey Centre's first settlers wouldn't arrive for another ten years, and the city of Vancouver wouldn't be established for another 25 years. 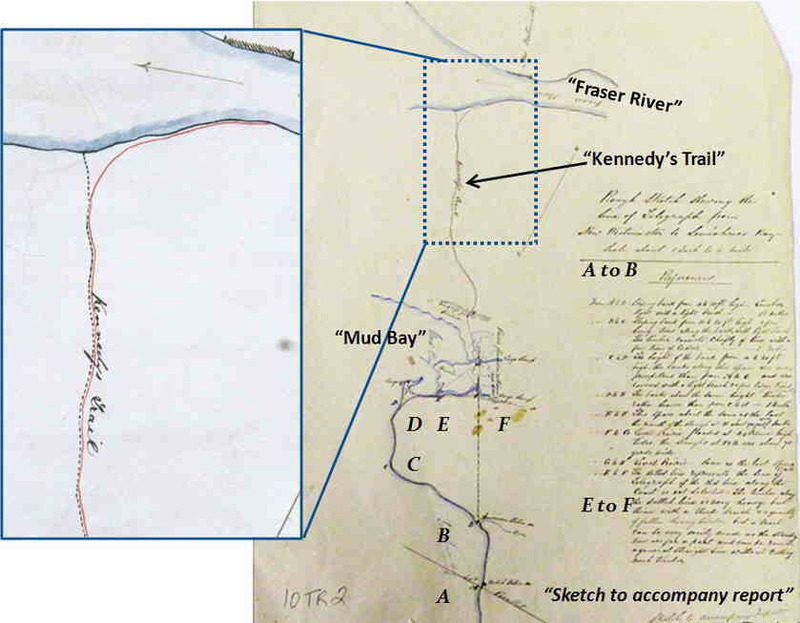 While the route of the later Semiahmoo Trail (1873) was partly documented through later land surveys, a complete detailed survey of the Kennedy Trail was done by the Royal Engineers in 1861. Unfortunately, the field book in which the survey was recorded does not include a map based on the survey. A number of early maps show the approximate route of Kennedy's Trail, and some partial maps of the route are clearly based on the 1861 survey. Only one map has been found which identifies it as "Kennedy's Trail" and it shows only an approximate sketch of the route. Recently, with the aid of computer software, the information from the Royal Engineers 1861 survey was processed and accurately mapped, revealing the route of the Kennedy Trail. This new information has in turn helped to identify remnants of the trail which can be found today. Information about the Kennedy Trail was recorded in more than 40 letters written by Kennedy, Governor James Douglas, the Commissioner of Lands and Works, Colonel Moody, and other members of the Royal Engineers. [Source: Colonial Correspondence files, GR-1372, BC Archives, Victoria.] There were also a number of letters and news items about the Kennedy Trail published in New Westminster's The British Columbian and Victoria's The British Colonist newspapers. 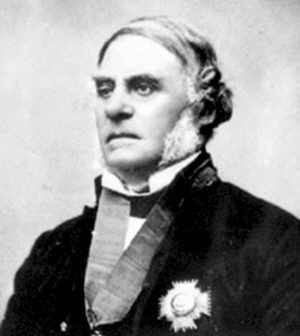 James Douglas resided in Victoria. He was Governor of the separate British colonies of Vancouver Island and British Columbia. 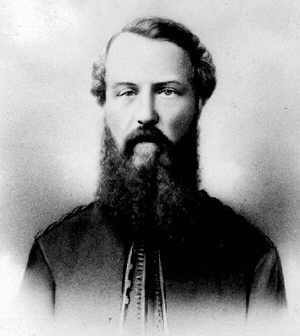 Richard Clement Moody was the commander of the British Army's Royal Engineers Columbia Detachment at New Westminster, and BC's Commissioner of Lands and Works. In recent times, little was known about the actual route of Kennedy's Trail through North Delta and Surrey. Articles about early trails near New Westminster written in 1943 by William Draper and in 1982 by Bob Harris had erroneously described the Kennedy Trail as having followed the route used later by the railway along the edge of Burns Bog. A number of more recent local history books mention the Kennedy Trail, but give conflicting information as to its route and number of branches, its relationship to the 1865 Telegraph Trail, and the extension to Brownsville opposite New Westminster. After the mainland Colony of British Columbia was established in 1858, the Royal Engineers built a number of early roads and trails around New Westminster. The first trail built by a settler in the Lower Mainland was made by James Kennedy in the spring and summer of 1861. It was also the first trail between New Westminster and Mud Bay. The trail started on the south bank of the Fraser River, at Kennedy's 1860 land pre-emption opposite the north end of Annacis Island. It rose quickly up the side of a ravine to the high ground above the river where it followed the contours of the land across what later became North Delta and Surrey, through Panorama Ridge towards Mud Bay and Woodward's Hill. Just past the first mile, there was an uncompleted branch trail heading towards Fort Langley. As the main trail approached Panorama Ridge, it branched again. One branch continued south to what later became Colebrook, on the flats at Mud Bay. The other route headed south east towards the yet to be named Woodward Hill ending at the meadowland next to the Serpentine River at the base of hill. In 1865 the Kennedy Trail became a major part of the route used to bring the first telegraph line to New Westminster from San Francisco. 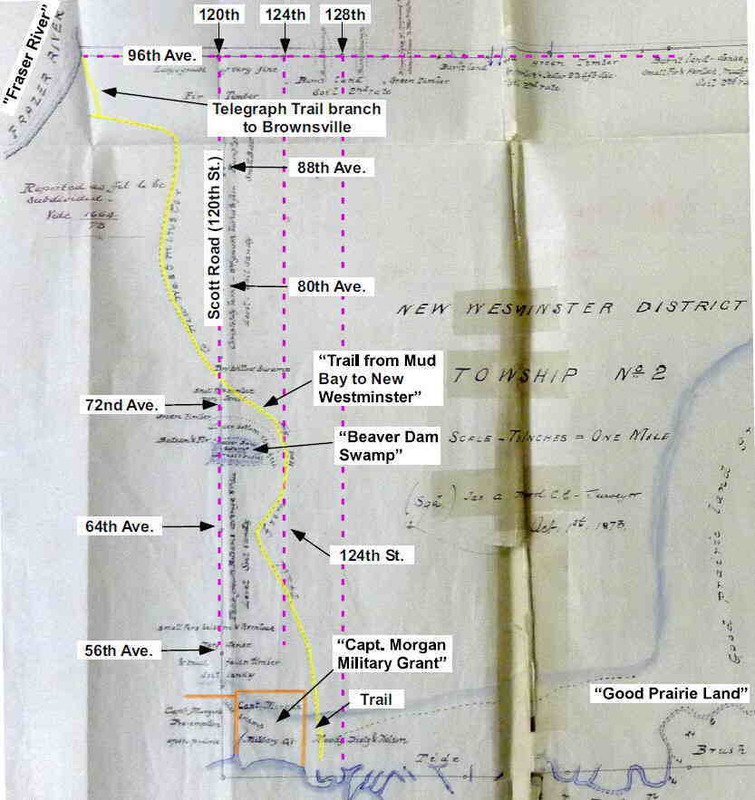 The north end of the trail was extended from Kennedy's land pre-emption to Brownsville where an underwater cable connected the telegraph line to New Westminster. James Kennedy, his wife Caroline and their two year old son James were among the first European families to settle in the Lower Mainland of British Columbia. They arrived in New Westminster in March 1859 from "Canada" (Ontario) via Panama. New Westminster, then known as Queensborough, was the capital of the new mainland Colony of British Columbia, the largest settlement on the mainland, and growing rapidly with the influx of miners looking for gold along the Fraser River. This was when British Columbia and Vancouver Island were still separate colonies of Britain. Kennedy was an architect, builder, and an entrepreneur. After some initial difficulty he found work constructing roads and buildings in New Westminster. In 1860 he became the first person to pre–empt un–surveyed land on the south side of the Fraser River in what is now the Annieville area of North Delta, near the boundary with Surrey (Lot 15, Group 2, New Westminster Land District). 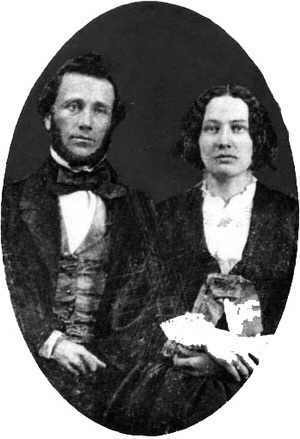 He taught school at Derby near Fort Langley between 1867 and 1873. He and his sons James M. and Robert eventually pre–empted or purchased more than a thousand acres of land in Delta and Surrey, mostly along Scott Road. Several of his sons worked for The British Columbian newspaper in New Westminster and his sons George, Robert, and James become its owners in 1888. Kennedy first wrote to Governor Douglas, in June of 1860 asking him to authorize Colonel Moody, to "open a trail from some point opposite New Westminster, across to some other point near to Semiahmoo Bay". He said"it would be the cause of speedy settlement of the land." In October he wrote similar letters to both Douglas and Moody, describing a small river (the Serpentine River) with good meadow land on either side, which emptied into Mud Bay and was about seven miles south of his pre-emption. Kennedy said that he and other settlers on that side of the Fraser were "destitute of meadow land" and that allowing them to build the trail would enable them to pay for their land. Kennedy said he was ready to start the next morning to explore the small river and run a line for a trail from his place to the mouth of it at Mud Bay. "the trail ought to start at a point where the line between my claim [Lot 15] and the Sapper's strikes the River, at that place there is a commodious little bay and very deep water [at the mouth of Collings Creek Ravine], with an easy grade up to the table land from thence it should run on an East line until it would intersect the trail which is under contract from opposite Manson Island [now Tree Island] to Langley which would be perhaps three (3) Miles, the trail or branch which I propose towards Mud Bay should start about a mile from the River on the Main line to Langley [Fort Langley] and run directly South which would penetrate the center of that beautiful level section of country which I described to you after my exploring tour in that region and which would strike I think a little above the mouth of the little [Serpentine] river emptying into Mud Bay, the length of this branch would probably be Six (6) Miles, both these trails should be straight lines or at least confined in Width of a Road Way of 66 feet and should be designed as permanent leading roads, the one to Langley and the Upper Country, and the other to the boundary line." 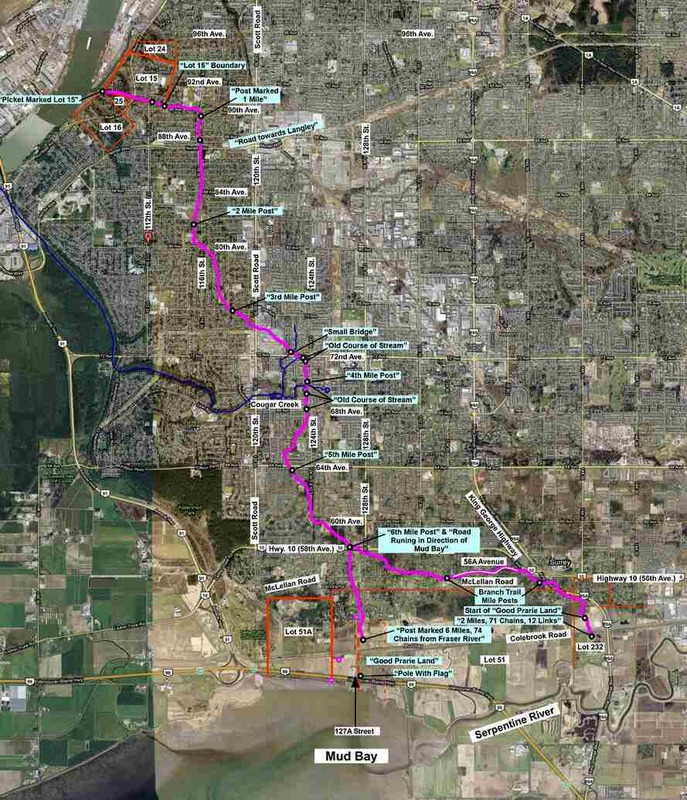 (When Kennedy realized that the connection to the Fort Langley trail would be about seven miles, he asked for a 4 mile extension, but only the first 3 mile of it was completed.) Kennedy said he would make the trails ten feet wide, clear them of brush and logs, make bridges where necessary, and culvert all running streams to "make it fit for a pleasurable excursion on horseback, even for Ladies." He said he would build the trail for $300 dollars per mile, with one quarter paid in cash, and the balance in land scrip, so that he could pay for his land and for others who would assist him. Kennedy tried unsuccessfully to get support for his trail from the residents of New Westminster. While he was building the trail he was criticized in anonymous letters to the editor of The British Columbian newspaper which questioned how he had obtained his road contract, and noted that he was sub–contracting much of the work at a profit. A letter to the editor of The British Columbian newspaper published on April 18th, 1861 signed "Ishmael" complained about "the practice of giving out government jobs by private contract". The writer referred to the private contract given to "a Mr. Trutch" for a wagon road, a party who was allowed back out of a contract for a trail from Hope to Similkameen, and "Kennedy's trail on the south side of the river". He said that Kennedy "went to the Governor, and by a secret bargain, obtained the contract for making eleven miles of trail at $330 per mile, and has sublet the job at $200 per mile, quietly pocketing the sum of $1650 of the public, without striking a blow." "at the time I first proposed to open a trail to Mud Bay, the people of New Westminster opposed it at a public meeting, and refused to vote for an appropriation for that purpose, and after I succeeded in getting the contract for opening the trail, there was every possible effort made to stop me, and even Col. Moody himself was so far influenced by public opinion that he expressed very grave doubts as to his allowing me to go on with the work, because [indeed] I had let part of it by contract." Although Kennedy was ready to start building the trail in late November 1860, and stated he had four men ready to start working on the trail in exchange for land scrip, it took another two months for him to reach a final agreement with Moody as to the specifications. Moody also questioned the size and boundaries of Kennedy's pre–emption claim and Kennedy feared he would lose the side of the ravine he was going to use to take the trail to the high ground above the river. He pleaded with Governor Douglas to protect him from Moody. Kennedy wrote to Moody in a conciliatory tone on January 29th saying that he had everything ready to start building the trail and was only waiting for Moody to give the word to begin. He offered to provide lodging for one of Moody's engineers in the "house" on his pre–emption. Kennedy said he had installed a stove to keep them warm at night and would appreciate the company. He said he hoped to move his men over that day to fix the huts in which they would stay. 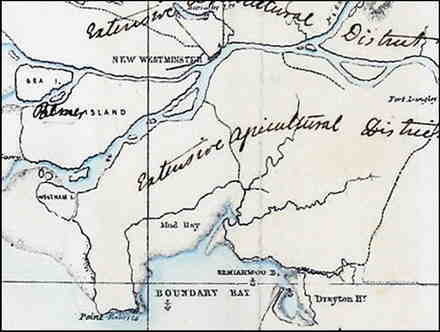 Part of a map attached to Kennedy's 1861 road contract showing the starting point (A) and the general direction of the proposed roads to Langley and Boundary Bay. Details from Kennedy's 1861 road contract map (black lines) and an 1862 map (orange & blue lines) overlaid on a 2009 street map. Was it to be a Wagon Road or a Horse Trail? Soon after Kennedy started construction, the question of whether the he was building a road or a trail became a contentious on–going issue with the Royal Engineers who inspected his work. Although Kennedy once used the term "permanent leading road" to describe his proposed route to Mud Bay, he mainly referred to it as a trail. It's clear from the letters he wrote to Moody and Douglas that his intention was to build a ten foot wide horse trail, not a wagon road. In his November 1860 letter to Moody, Kennedy wrote that the trail he proposed would be "fit for a pleasurable excursion on horseback, even for Ladies." In an April 1861 letter to Governor Douglas, Kennedy said that when Colonel Moody's right hand man "Mr. Holmes was over to inspect the Trail he declared that he would make my trail into a Major Road for $100 per mile." Inspection reports for the first two miles done by Captain Grant on April 6th and Captain Luard on April 12th described it as "a good trail, but not a wagon road." Kennedy insisted that what he had built was consistent with the contract specifications. Kennedy wrote a four page letter to Governor Douglas on April 2nd to inform his that "the Commissioner of Lands and Works [Colonel Moody] has again commenced his old tricks with me." He said Moody had told him that the amount of land paid in scrip should be based on the ten shillings per acre amount that was in effect during their earlier contract negotiations. Kennedy pointed out that on March 13th he had been paid in land scrip based on the current 4 shillings, 2 pence per acre rate. Kennedy said that after receiving an unfavourable inspection report from Captain Grant, Colonel Moody refused to pay him for the work he had done. He said "Grant came over in a boat... to look around and shoot some game..." Kennedy said "at that time there was one mile finished and a little over two miles logged out ready for finishing... I did not represent any part of the trail as being finished... I have since finished another mile and notified Col. Moody... what his next move will be I don't know but... he will do everything in his power to stop the trail. He has been always been opposed to it." Kennedy told Douglas that if he couldn't guarantee him some protection and support, he "must stop the work". On April 6th, Sergeant James Lindsay wrote an inspection report on the first two miles of Kennedy's trail. He said that the beginning of the first mile of trail was too narrow and too steep for a wagon road, that he found stumps above the surface of the road, and that there was a soft section due to surface water on the side of the road which required corduroying. He said that he considered it "to be only a good trail, but not a wagon road." On April 16th Kennedy wrote to Moody telling him that the second mile towards Mud Bay was finished and that he had done the work "in strict accordance with the specifications as near as I can do it." 1861 Map showing the Kennedy (main Branch) and Langley Trails with added labels and magenta coloured line showing the uncompleted connection between the trails. Moody and his men kept refusing further payments as the trail progressed, until Kennedy had completed more than seven miles and repairs had been done to Moody's satisfaction. On May 7th Acting Sergeant Major George Cann wrote an inspection report on both the Langley and Boundary Bay branches of Kennedy's trail. He said he considered it "nothing but a trail and not a road" and that parts of the Langley branch were "not safe for mules to travel over with packs loaded" and that both roads required corduroying, culverts, and drains. On July 1st, Kennedy wrote to Moody to say that he had completed six miles toward Mud Bay and three miles toward Langley. He said he had eleven men working on the last four miles at Mud Bay and hoped to be finished in a short time. In another letter written to Moody ten days later Kennedy said he had one of the last four miles done, that he was out to the meadow, and that he had "started the branch up the valley." He described his recent work saying "The mosquitoes are horrible in the woods. I suffered like a martyr in spotting the line. It is a dreadful place to make a trail. The logs and underbrush are so thick; I shall want some money to carry on the work on these four miles." (The valley Kennedy refers to is a ravine with an un–named creek flowing down to the flats from Panorama Ridge at about 128th Street. Part of the woods Kennedy described remains today.) He said that the repairs needed on the first nine miles which were pointed out by Captain Luard would be done that day. Kennedy wrote to Captain Luard on August 1st to tell him that he was almost ready to have the last four miles surveyed and inspected. Kennedy built a total of thirteen miles of trail (three miles along the branch trail towards Fort Langley, seven miles of the main trail from the Fraser River to Colebrook at Mud Bay, and three miles of the branch trail to the Serpentine flats at the base of Woodward Hill. Peacock's Pre–Emption on the Kennedy Trail at Mud Bay. Peacock also registered two other adjoining pre–emptions on the same date. These were P/R 291 for 240 acres "lying to the east of the above claim" and P/R 290 for 80 acres "lying to the north of the claim first registered." Peacock did not receive a Crown grant for any of these claims, and as a result they were not surveyed as district lots. 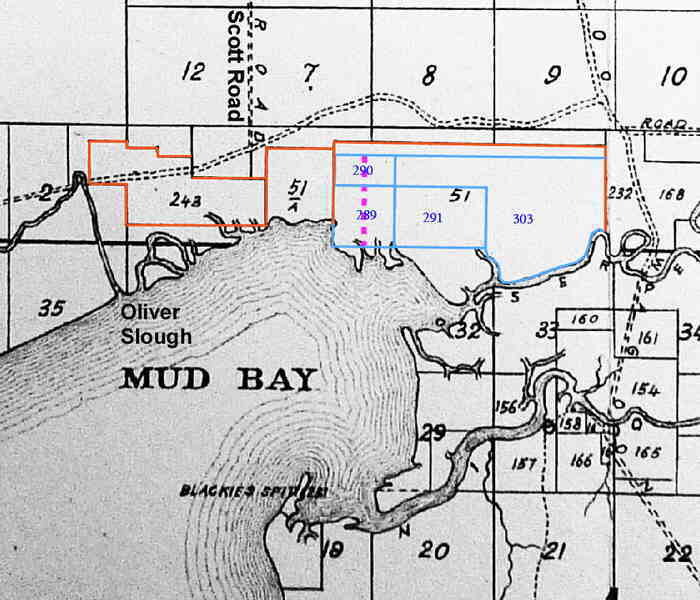 Since the claims were never surveyed, other than the references to Mud Bay and Kennedy's trail there is no other information in the pre–emption record to indicate their exact location at Mud Bay. Sketch from William Peacock's 1861 Pre–Emption Record No. 289–291 with the area covered under P/R 289 outlined in blue, and the "Kennedy Branch Trail" marked in magenta. Captain Henry Ross Lewin Morgan was a veteran of the Crimean War who settled at Mud Bay in 1869. In 1873 he obtained Crown Grant 1351 for 206 acres of land at Mud Bay under the Military and Naval Settlers Act. 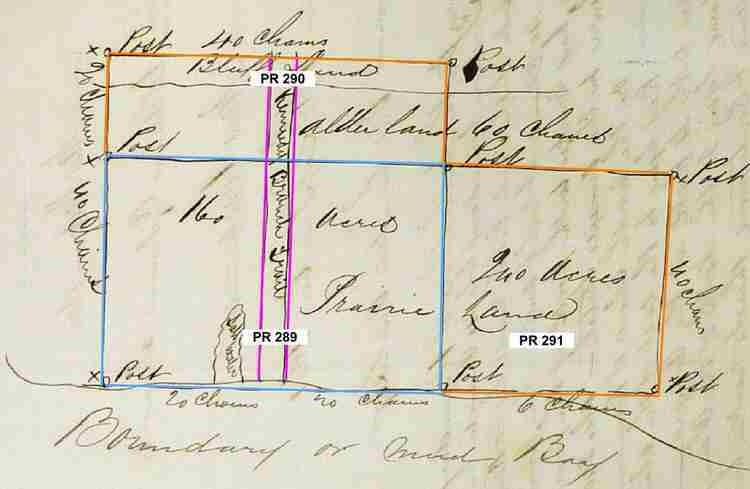 This land was immediately to the west of William Peacock's 1861 Pre–emption Record 289 and was surveyed as Lot 51A, next to the larger Lot 51. Plan of Morgan's 1873 Lot 51A Crown Grant 1351 with the described location of William Peacock's Pre–emption No. 289 added in blue, along with other details. Several news items and letters to the editor published in The British Columbian (New Westminster) and The British Colonist (Victoria) newspapers after the completion of the Kennedy Trail in 1861 provide information about the Kennedy Trail. During the winter of 1862, the Fraser River froze solid above and below New Westminster, bringing navigation up and down the river to a halt, and preventing supplies from reaching both the city and the Royal Engineers Camp. 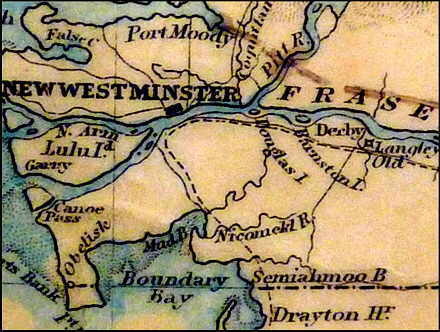 The January 20th, 1862 edition of Victoria's The British Colonist reported that the trail from Mud Bay to New Westminster (the Kennedy Trail) would be used if the ship sailing from Victoria could not reach New Westminster by the Fraser. "The Schooner Explorer, Capt. Whitford, sailed at 12 o'clock on Saturday night last for New Westminster, with 50 tons of freight and a dozen passengers on board. If possible the Explore will proceed direct to 'the metropolis;' but if Jack Frost has not loosened his icy grip on the throat of the great artery of our sister Colony, the passengers will disembark at Point Roberts or at Mud Bay and attempt to reach New Westminster by trail, while the schooner with the goods will wait outside until navigation reopens." "From the Columbian CALIFORNIA STATE TELEGRAPH CO. – Mr. R. R. Haines, Assistant Superintendent of the telegraph in the course of construction... is at present in this city... for the purpose of exploring for a suitable line of route. From Mud Bay to here [New Westminster] advantage will be taken of the road constructed a few years ago by Mr. Kennedy." There does not appear to be any historical evidence to support Draper's statement that "Kennedy extended the trail up the Fraser to the wharf at Brownsville, opposite the city of New Westminster, and for some distance beyond that point." Draper also wrote that Kennedy was proud when he brought beef cattle to ice bound New Westminster in the winter of 1861–62 after landing them "at the Oliver Slough." He appears to be quoting from Kennedy's letter published in the January 23rd, 1862 edition of The British Columbian. Kennedy, however, never referred to Oliver Slough which wasn't even named until decades later. Unfortunately, since Draper's article provided a clear and concise description of the route of the Kennedy Trail, this misinformation has been repeated in a number of books published as recently as 2008. Although Kennedy's January 1861 road contract with Colonel Moody included a scale map accurately showing the starting point of the trail, only the general direction of the Langley and Mud Bay branches were indicated. 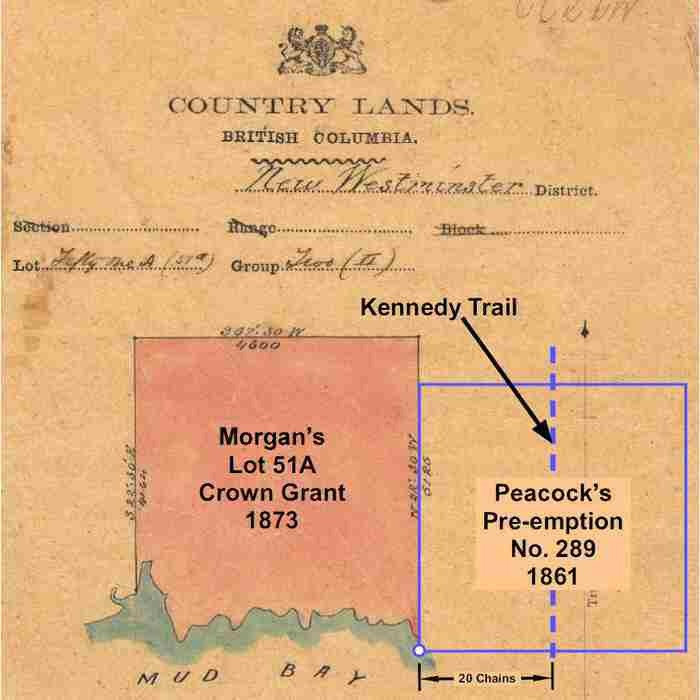 The first historical map to show the completed Kennedy Trail was probably a map produced by Colonel Moody in August, 1861 to document the agricultural potential of the lower Fraser Valley. 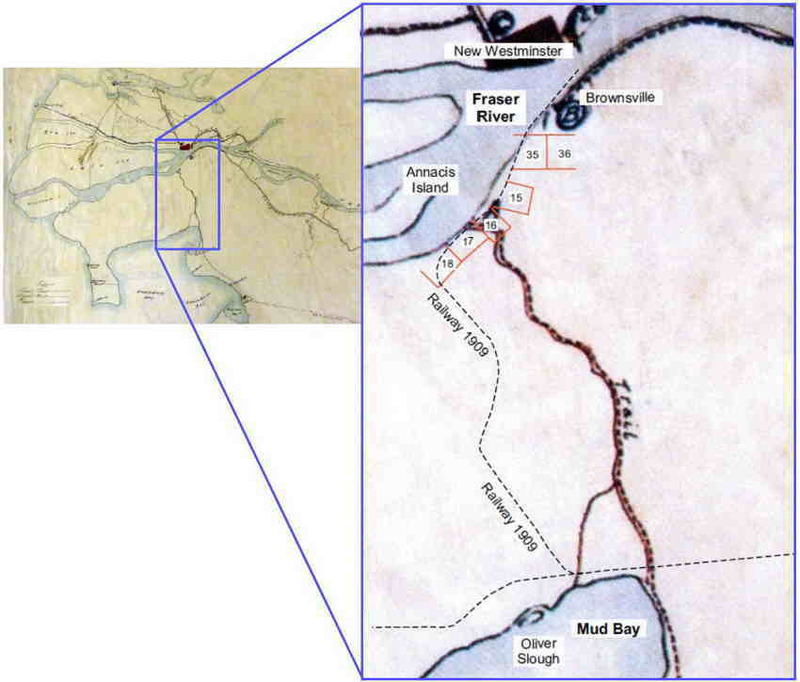 It shows the approximate route of the main branch of the trail from the Fraser River to Mud Bay. Other maps including those by Launders in 1865, Anderson in 1867, and Trutch in 1871 show the Kennedy Trail, but do not identify it by that name. While limited in detail, these maps all show a trail starting on the bank of the Fraser River opposite the north end of Annacis Island, crossing the high ground of North Delta into Surrey and arriving at Mud Bay near the mouth of the Serpentine River. Only one historical map (1864) has been found which labels the trail with Kennedy's name. Other maps made in the 1860s, 70s, and 80s either did not name it or used the words "Trail", "Mud Bay, New Westminster, Semiahmoo, or Telegraph" to describe it's route. It wasn't until after British Columbia joined Confederation in 1871 that more detailed maps were produced. However, by the time of the 1876 maps showing Scott Road, the Semiahmoo Trail, the beginnings of Ladner Trunk Road and McLellan Road, the Kennedy Trail had become less important and was no longer shown. On December 9th, 1864 William McColl submitted a report to the Colonial Secretary on his survey of a route for the telegraph line from the United States. McColl said the route from Mud Bay would follow the Kennedy Trail, but that the trail required some clearing and some of the corduroying needed repair to restore it to its original condition. A sketched map attached to the report identifies "Kennedy's Trail" and shows the proposed route from the International border to New Westminster. 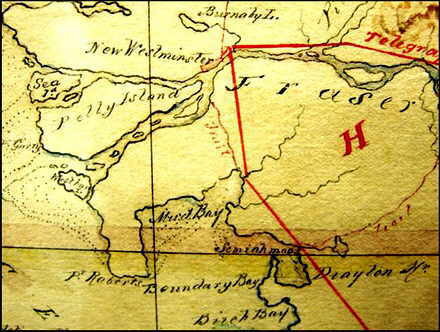 Part of a "Rough Sketch Showing the line of telegraph from New Westminster to Semiahmoo Bay" attached to William McColl's report. It shows the Fraser River and New Westminster in the north, with Mud Bay, the Serpentine and Nicomekl Rivers, in the south. The trail cutting across the Surrey–North Delta peninsula is labeled "Kennedy's Trail". The northern part (enlarged view) branches, one part going directly to the Fraser River, and the other part following the south bank to a point opposite New Westminster (Brownsville). At the south end, the Kennedy Trail connects with the proposed route of the Telegraph Line from the United States. 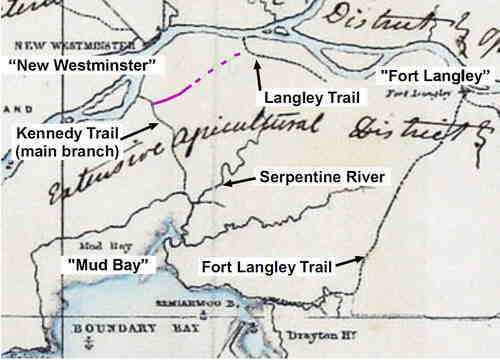 An 1865 map of trails in the Fraser Valley from Hope to Vancouver shows a route labeled "Trail" highlighted in red which begins on the south side of the Fraser River opposite Annacis Island near Kennedy's Lot 15, travels southeast into Surrey and then branches. The right branch goes southeast around Mud Bay and connects with the telegraph line from the U.S. The left Branch goes southwest towards Mud Bay. This is the approximate route of the 1861 Kennedy Trail. 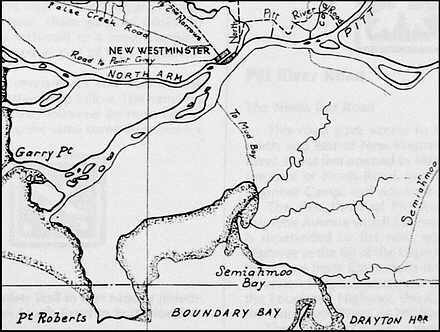 This July 3rd, 1873 sketched map shows both the Kennedy Trail (labeled "Mud Bay Trail") and the proposed road from Brownsville opposite New Westminster to Semiahmoo (not labeled). 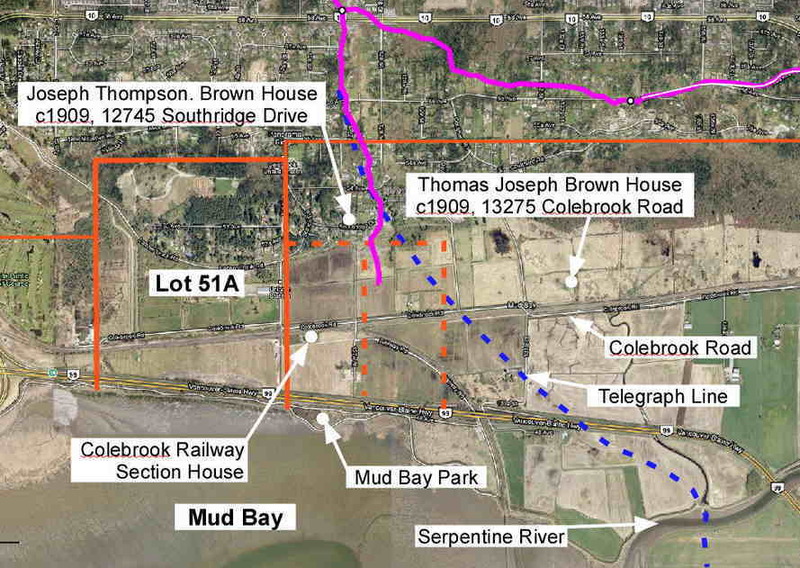 It was drawn at the time the contracts were awarded to construct the Semiahmoo Wagon Road. The map includes the name of Robert Beaven, the Chief Commissioner of the B.C. Lands and Works Department at the time. Although not a scale map, the route of the Kennedy Trail is clearly based on the 1861 survey done by the Royal Engineers. 1873 map showing both the Kennedy Trail (labeled "Mud Bay Trail") and the then proposed Semiahmoo Road (not labeled). The magenta coloured line shows the surveyed route of the Kennedy Trail. Details at the southern end of the map are distorted and shown further north than they actually are. This sketched map is part of the survey done by James Mahood on October 1st, 1873. 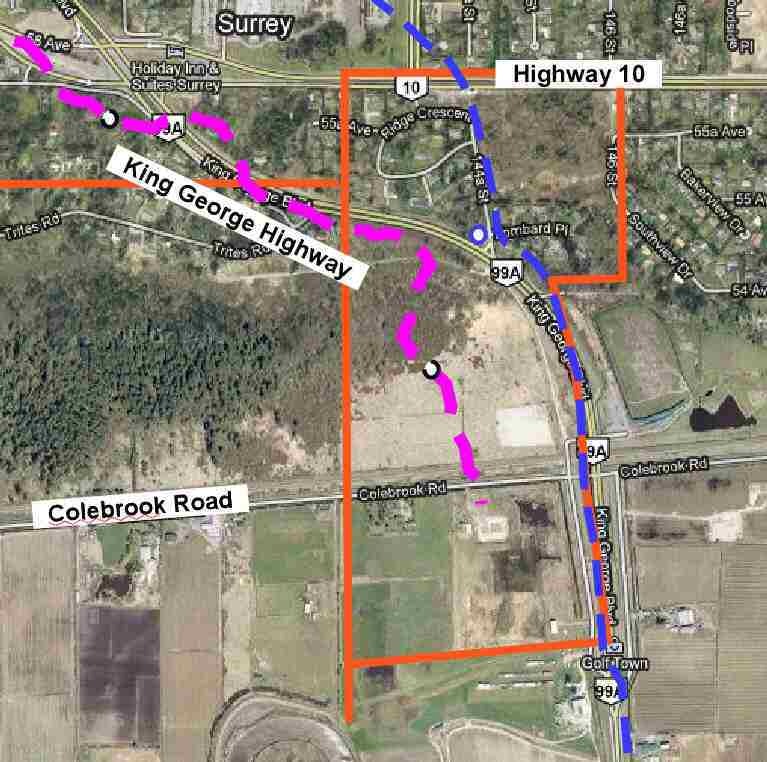 It outlined Surrey's Township No. 2 into one mile sections of land. 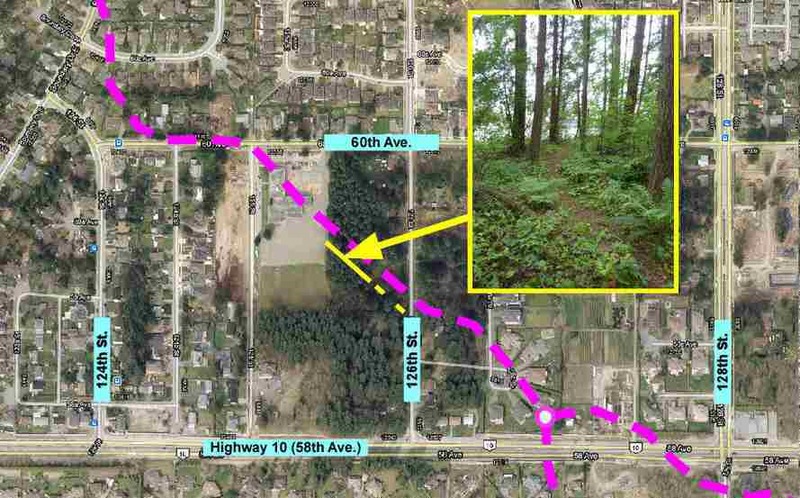 This area is now bounded by 96th Avenue, Scott Road, the equivalent of 48th Avenue, and 168 Street. Near the Fraser River and 96th Avenue, it shows the branch from the Kennedy Trail which the Telegraph Trail followed to Brownsville in 1865. 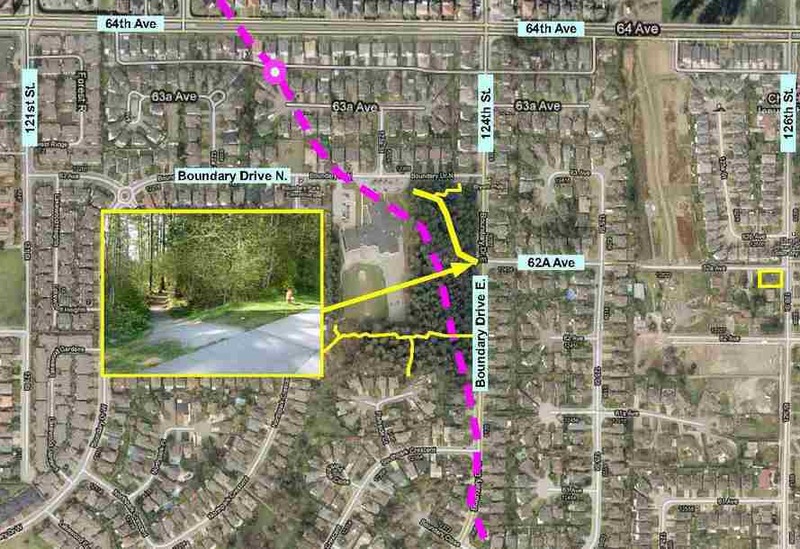 It also shows the "Trail from Mud Bay to New Westminster" crossing Scott Road just north of 72nd and going around the "Beaver Dam Swamp" and roughly following 124th St. (magenta dotted line) south to a point at Mud Bay just east of Captain Morgan's Lot 51A. 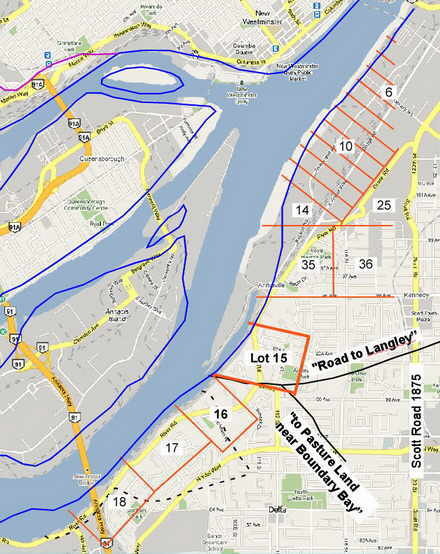 The illustration shows a small portion of a New Westminster Land District map published by the Canadian Department of the Interior Technical Branch. While the map is labeled "revised to 1889," it was probably first drawn in the mid 1870s after British Columbia joined Confederation in 1871, and after the Township subdivision were started in 1873. It shows the routes of a number of early trails, including what appears to be the Kennedy Trail crossing Scott Road into Surrey and reaching Mud Bay just east of Captain Morgan's Lot 51A. In March 2010 the original survey record of the Kennedy Trail made by the Royal Engineers in 1861 was located in Field Book 16 at the Land Titles office Survey Vault in Victoria. The first entry in the table of contents is "Survey of Lots 15 (Kennedy's), 16 (the Sapper's), 17, & 18". The second entry is "Survey of Trail from Lot 15 to Mud Bay" (The Kennedy Trail). Since a complete map based on this survey was not found in 2010, the original 1861 data was accurately plotted using Microsoft Excel and Canvas X technical illustration software. Each survey point in the Excel plot of the 1861 route was carefully traced and then overlaid onto other maps. With the aid of this new information, several remaining parts of the Kennedy Trail were located in Delta and Surrey. In 2014 a detailed scale map based on the Royal Engineers 1861 survey of the Kennedy Trail was found at the Land Titles office in Victoria by Surrey historian Jim Foulkes. 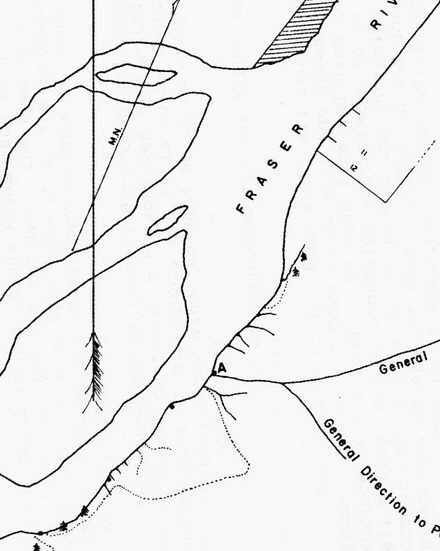 This 1876 maps shows the main branch of the Kennedy Trail from the Fraser River to Mud Bay, as well as later trails and roads, and very closely matches the computer plot of the original survey done in 2010. Royal Engineers Field Book 16, Page 7 recorded the survey data for the Kennedy Trail between mile posts 3 and 5 where the trail crossed several tributaries of Cougar Creek and its beaver pond. Note that the lines on this page do not represent a map of the survey data, but are just a means of sequentially recording the length (in chain links, 100 links = 66 feet)) and the magnetic bearing (in degrees and minutes) for each leg of the survey. Neither the length of the lines nor their angles on the page are to scale. 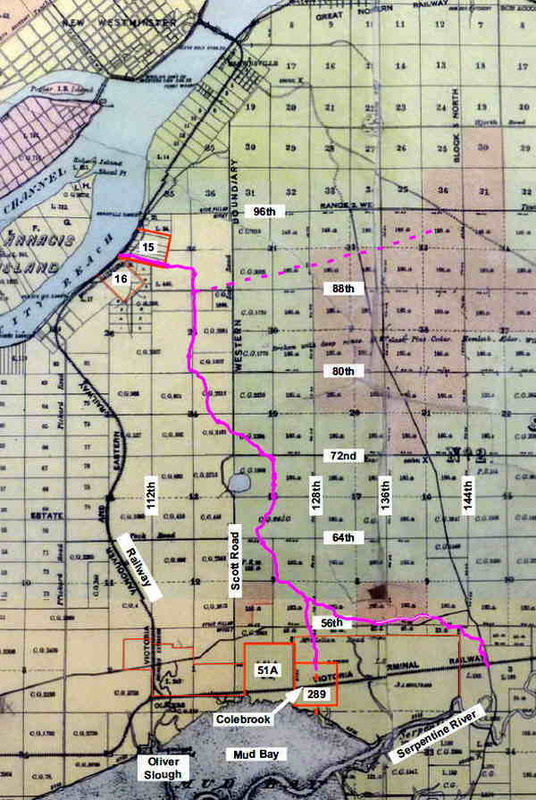 The surveyed route of the 1861 Kennedy Trail (magenta line) has been overlaid onto a 1905 Map. District Lots 15, 16, & 51A and P/R 289 have been highlighted in orange. The map also shows the locations of the beaver pond on Scott Road, McLellan Road, the Semiahmoo Wagon Road, the railway line, and Oliver Slough. 1861 Kennedy Trail route (magenta line) overlaid onto a 1905 Map. This scale map shows the 1874 survey by J. W Carey which divided Surrey's Township No. 2 into 160 acre quarter mile sections. It also noted the route of the "New Westminster & Semiahmoo Telegraph Trail", but only at the ten points where it crossed the one mile section boundaries. The route between these points was estimated. The overlaid magenta line shows the route as recorded by the more detailed 1861 survey of the Kennedy Trail, which recorded more than 170 locations over the same area. 1861 Kennedy Trail route overlaid onto an 1874 Township Scale Map Showing the Telegraph Trail. The white dots mark the 10 survey points recorded on the "Telegraph" trails in 1874. The dotted and solid black lines show the estimated routes in between these points. 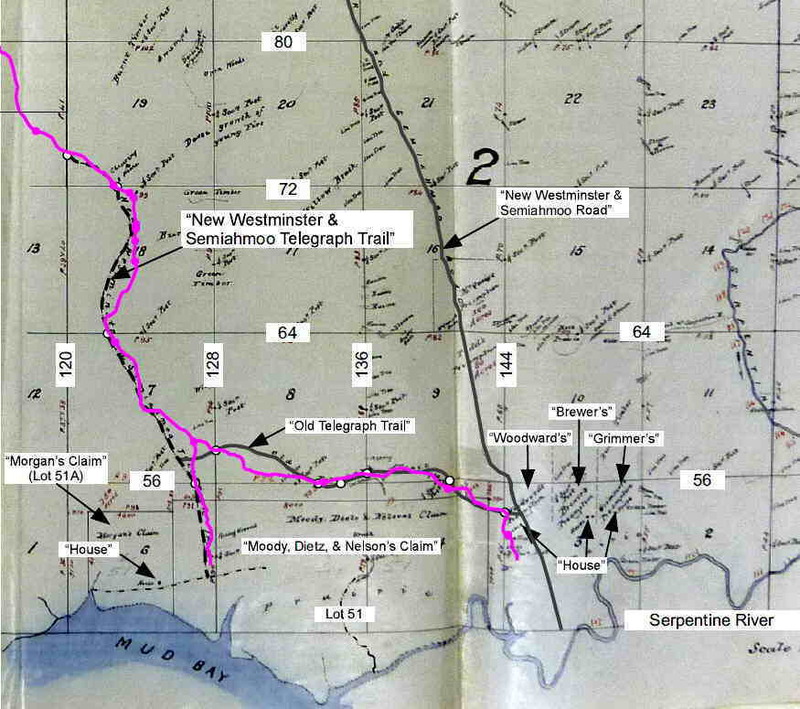 The magenta line connects the 170 survey points from the detailed 1861 Kennedy Trail Survey. This composite satellite image shows the route of the Kennedy Trail across the current landscape. 2010 Google Map Satellite Image with the Route of the Kennedy Trail added. Now that the 1861 survey of the Kennedy Trail has been accurately mapped, it is possible to compare the route with present day locations and look for existing evidence of original the trail. There are at least six locations where the route of the Kennedy Trail passes through present day parks and school grounds in Surrey including Beaver Creek Park, Boundary Park & Elementary School, J.T. Brown Elementary School, Corrigan Park, Mud Bay Park, and Colebrook Park. Existing trails in both Boundary Park and Corrigan Park coincide closely with the surveyed route. In the eastern portion of Panorama Ridge, a curved section of McClellan Road, now called 56A Avenue follows the same sequence of curves as the original Kennedy Trail. There was only one bridge constructed on the Kennedy Trail between the Fraser River and Mud Bay. This was at the northern branch of Cougar Creek and was noted in the 1861 survey as "Small Bridge." At four other points in the area the survey noted an "Old Course of Stream". At one of these locations, just south of the " Mile Post" is the present day southern branch of Cougar Creek, where it crosses under 124th Street. In his December 1864 report on the proposed route of the telegraph line Sergeant Willam McColl noted that "a few yards of corduroying across a small stream (near midway) will require to be fixed." 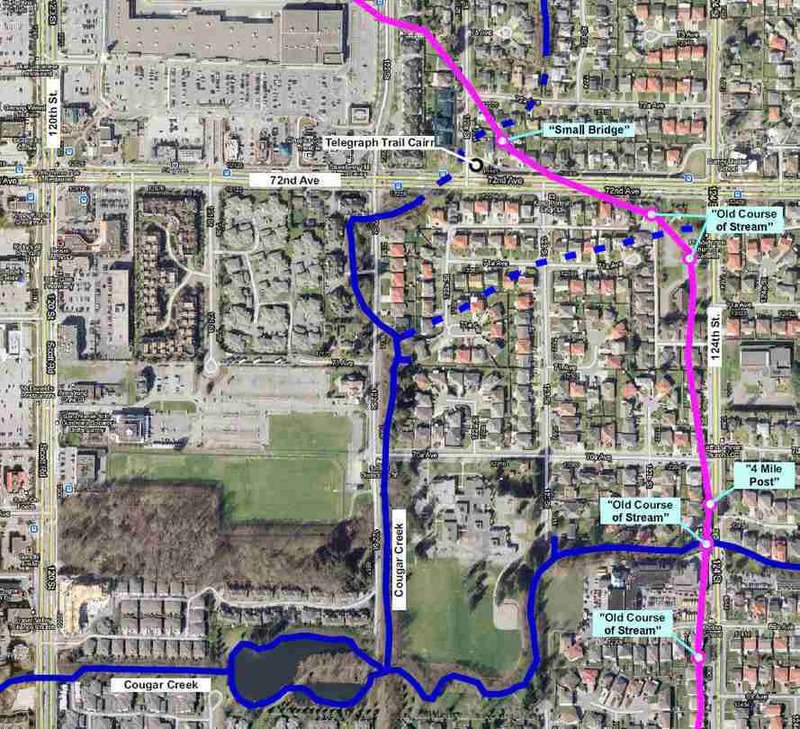 This present day aerial view shows where the 1861 Kennedy Trail (magenta line) crossed the tributaries to Cougar Creek (blue lines) east of Scott Road near 72nd Avenue and 124th Street. The white dot shows the location of the 1988 cairn which commemorated the construction of the 1865 telegraph line. It was located on public land as close a possible to the actual route. Fred Hilton is a World War II veteran who lives at the corner of 126th Street and 62A Avenue. When asked about the trail at the end of 62A Avenue which runs through Boundary Park towards the school, he said that there was an "old wagon road" there when he built his home in 1957. At that time he said the area around him was all five acre lots and there were no houses between his and Scott Road. The illustration below is an aerial view of Boundary Park showing the approximate route of the Kennedy Trail running across the northern part of Boundary Park next to Boundary Park School (dotted magenta line) and the present day trail (yellow line). Aerial view of Boundary Park showing the approximate route indicated by the Royal Engineers 1861 survey (dotted magenta line) and the existing trail today (yellow line). Both the direction of existing trail and the jog at the north end of the park coincide well with the surveyed route. The jog at the south end of the existing trail would be a recent addition. Fred Hilton who moved into the area in 1957 said: "That trail was an old wagon road." Part of the existing trail is shown in the inset image. Development of Corrigan Park near J. T. Brown Elementary School began in 2010. The land had previously been owned by the Corrigan family. An existing trail which runs partway across the property coincides with the location and compass bearing of the 1861 Kennedy Trail. Aerial view of Corrigan Park showing the approximate route indicated by the Royal Engineers 1861 survey (dotted magenta line) and the existing trail today (yellow line). The direction of existing trail coincides very well with the surveyed route. The insert image shows the trail as it was found in May 2010. The south branch of the Kennedy trail reached the shore of Mud Bay near Colebrook at what is now Mud Bay Park. In 1861 the Telegraph Line from the United States to New Westminster joined the Kennedy Trail at the edge of Panorama Ridge. This aerial view of the eastern part of Panorama Ridge shows how the route of the Kennedy Trail closely coincides with an old section of McLellan Road now known as 56th and 56A Avenues. Aerial view of the eastern part of Panorama Ridge showing the route indicated by the Royal Engineers 1861 survey (magenta line) and the existing road pavement today (yellow line) along 56th and 56A Avenues (McLellan Road). A branch of the 1861 Kennedy Trail went east and then south east across Panorama Ridge towards the yet to be named Woodward Hill, ending at the meadowland next to the Serpentine River at the base of the hill. The route taken by Kennedy across the slope was similar to that used when the King George Highway was constructed in 1940. William Woodward who pre–empted land there in 1873 would have used the Kennedy Trail to travel between his property and New Westminster until the Semiahmoo Trail was completed later that year.